A distinguished journalist, a human being par excellence, who will always be remembered for fearlessly upholding the freedom of the press, Ved Bhasin was born on May 1 in 1929 in Jammu. An alumnus of Prince of Wales College, Jammu (now G G M Science College), Bhasin was known for his fearless, bold and independent journalism. He is regarded as a pioneer and a legend in the field who maintained highest standards and ethics in journalism. With the firm belief that humanity is the core of life, he always sided with the oppressed and down-trodden and took up their cause. He was active for almost 70 years in active journalism and was also close to politics. Politics, in fact, was his first love, that eventually gave way to journalism. He had been close to players that mattered in Kashmir and witness to unreported histories. His journo-political career gave him the privileged inside out view of many events. He was also known for his contribution to the field of literature and culture and was engaged in social movements. Ved Bhasin was widely known across the world and was considered among the top-ranking Kashmir experts. Popularly known as `Ved Ji’ or `Ved Saab’ among friends and acquaintances, his work and life won respect and admiration from all quarters of society and from across Jammu and Kashmir. 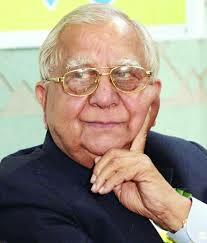 He was Chairman, Kashmir Times Group and remained the President of Press Club of Jammu thrice.